Simply reverse the previous pattern so the accented strums now fall on the upbeats. Now the light shallow strums are landing on the downbeats. 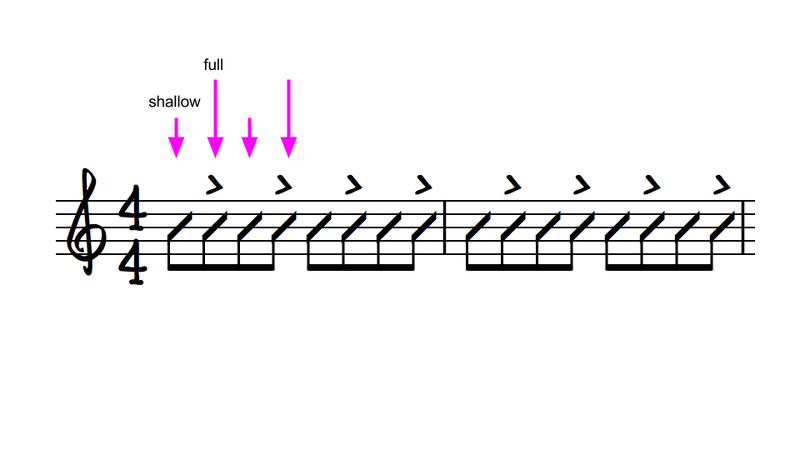 These 2 very basic patterns provide the foundation for emphasizing any beat within a measure. As you'll see in the coming lessons, the patterns will start to get more interesting when you start combining the first 2 Foundational Patterns in different ways. Let's do some practice. In the next lesson I've provided some practice exercises to get you familiar with Foundational Patterns 1 and 2 using different chords.